We are runners, walkers and joggers that get together every Sunday. 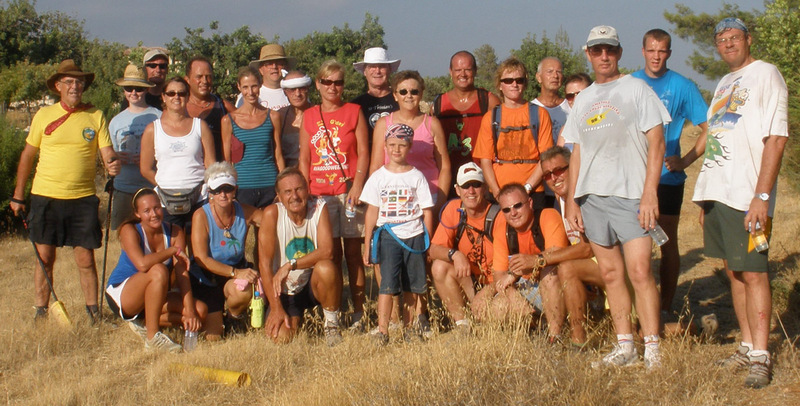 We are a local chapter of the Worldwide Hash House Harriers. Each chapter is wholly independent. Anyone that would like to have some fun, drink some beer and get a bit of exercise can join us for our next trail. There is no formal membership and we LOVE for new people come out and join in the fun. You should check out the About Hashing page on this site for info as to what to bring. After our trail and circle, we usually go out for a meal at a close by taverna, or have a picnic right where we end. All it takes to be an Amathus hasher is a good sense of humor, an interest in the outdoors and half a mind. New hashers, either experienced or brand new to hashing, are always very welcome. Details about on the Amathus hash can be found at their website.